The other day I talked about my first real job at 15. In the comment dialogue I shared the reason I took a field labor job was to have money to buy more clothes, make-up and music. That’s all that was important to me at that age. Now it seems silly but teenagers have very different priorities. In fact, my priorities changed throughout my life. In my early 20’s I still wanted clothes but expanded my priority to include a car. I bought a Ford Pinto and took out my first loan. There weren’t any financial goals other than to pay living expenses, the car loan and then spend the rest on fun. Then I got married and had a family very quickly. My spending wasn’t selfish anymore. I had to buy things for the baby and our home. That pretty much continued for the next 20 years which included another baby, divorce and remarriage. I spent every penny earned and more. My son wanted to play on a travel hockey team and without financial consideration I said yes. As our income grew our lifestyle inflated. The kids became adults and suddenly retirement didn’t seem so far away. I knew something had to change so I could retire and travel with my husband. As long as kept the debt cycle going those plans were not going to happen. The question was how to get started? The answer came to me at church and not in a thunderbolt. They were taking signups for Financial Peace University. We never looked back and last month eliminated the last non-mortgage debt. Until the day I retire, saving for it is the priority. I’ve increased my 401K contribution to the maximum and will be opening a IRA within the next month. We still have fun and saving for vacations is an important part of our plan. It’s important to figure out what you want out of life as soon as possible. That way you can make sure all your decisions, including financial, ultimately support that goal. I just let life happen and what it got me is behind in realizing my dreams. Fortunately, my husband had it more together and we’ll still be able to retire as planned albeit on a smaller budget. Do you know your financial priorities? This post is part of Women’s Money Week 2012. For more posts about money in your 20s/30s/40s/50s/retirement see Money in Your 20’s/30’s/40’s/50’s/Retirement Roundup. I was always a saver and knew that it would help me get what I wanted in life. Aside from making my first house possible at 277 years old, it gave me the down payment for my first apartment building. As an “extremely low income” person (yes, there’s a government definition” and one whose real (inflation-adjusted) income has never changed dramatically, I find my financial priorities have remained consistent over several decades: after paying the rent on time and keeping food on the table and the electricity turned on, there is little left to save, spend, or invest. And Dave Ramsey sometimes isn’t much help. Not everyone can always increase a low income. I agree you have to have financial priorities in order to meet your goals. I don’t want to live paycheck to paycheck and I’m happy that we figured out our path to be financially savvy earlier in life. I know what you mean. At one point I spent when I had no money, then I spent all the money I had, now I save everything I can. 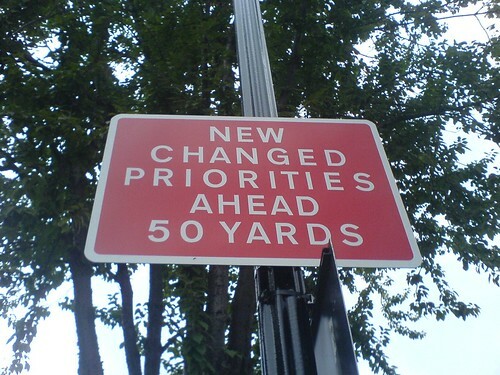 Sometimes you can tell how a person has matured by watching how their priorities have changed over the years. Spending habits can often show how responsible an individual can be. I hear what you are saying about pouring money into kids. Even though we try to be conservative with our expenses, kids just seem to need unexpected money for school and sports. I am reaching the point where I feel the need to begin to save more and get my financial priorities in order. I’ve seen my priorities shift over time ,and one thing I’ve noticed in the past few years, is that my money going into video games is dropping of to almost zero.. probably a good thing! Few young people take the time to see exercise and healthy habits as a real “investment”. I think that those priorities will shift the closer they get to retirement. Hopefully for most, it won’t be too late. Great post!